A former monastery dating back to the days of Inquisition in the 1600s, the Relais del Sant’Uffizio is a gorgeous hotel and restaurant nestled in the rolling hills of Monferrato, just outside Asti, in the heart of Barbera country. The romantic, tranquil setting is ideal for a weekend getaway or as a base for exploring many of the nearby attractions. A large outdoor pool is perfect for whiling away the hot days of summer, while the indoor spa and pool will appeal to those who are looking for the maximum in total serenity. I first visited Sant’Uffizio in 1997, when it was a smaller, family owned hotel with a very highly regarded restaurant. During the years I lived in Italy, Sant’Uffizio was one of my favorite places to escape the chaos of Milan. Today, Sant’Uffizio offers more services and rooms, while the property is as charming as ever. 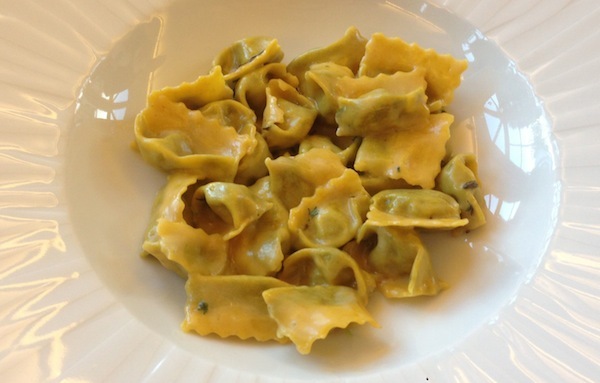 The restaurant was excellent on the two occasions we ate there, although the reality is that the overall quality of dining in Piedmont has exploded over the last 20 years, such that the food at Sant’Uffizio today is excellent, but has much more competition than it did years ago. The menu offers a combination of classics along with a handful of more creative dishes, all done with a modern, light touch. Visitors will find a small but well-chosen list with plenty of good options. Service is professional and attentive. 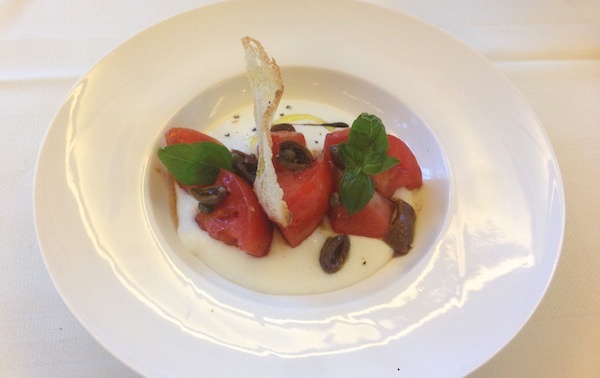 The burrata with tomatoes and olives is a delicious, cold appetizer perfect for the summer, with plenty of bright, bold flavors. Agnolotti del Plin, a Piedmontese standby, are virtually impossible to resist, even more so when they are topped with black truffles. Fassona is a breed of local beef known for its tenderness. 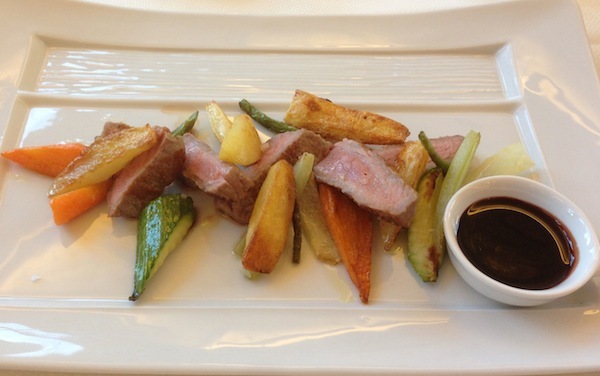 Our grilled steak, served with vegetables and Barbera reduction sauce, is cooked perfectly. The meat is flavorful and juicy, but not too strong, which makes it incredibly well suited as a vehicle for pairing with wine. In time, 2004 will go down as one of Bruno Giacosa’s greatest vintages, on a par with 1978, 1982 and 1989 for the sheer number of profound wines made that year. In the last few months I have tasted all of the 2004s (except the Barolo Croera) and they are all just as magnificent as they were upon release. On this night, though, it is the 2004 Barolo Riserva Le Rocche del Falletto that catches our attention. And how could it not? These wines have virtually disappeared from the market, so to see fairly priced bottles on a list anywhere is an opportunity that doesn’t present itself every day. Haunting, perfumed aromatics meld into the trademark Giacosa fruit as the 2004 Rocche del Falletto captivates the heart, soul and intellect. The tannins are firm yet noble, giving the 2004 a level of early accessibility that is now not uncommon in great Piedmont wines. Of course, the 2004 is only going to improve in bottle, but it is pretty special, even at this early stage. 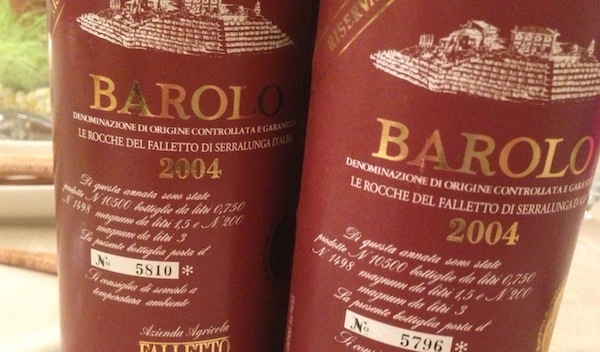 What could be better than Giacosa’s 2004 Rocche? Only a second bottle, which turned out to be a bit fresher and even more vibrant. The first bottle was terrific, but the second was extra terrestrial. 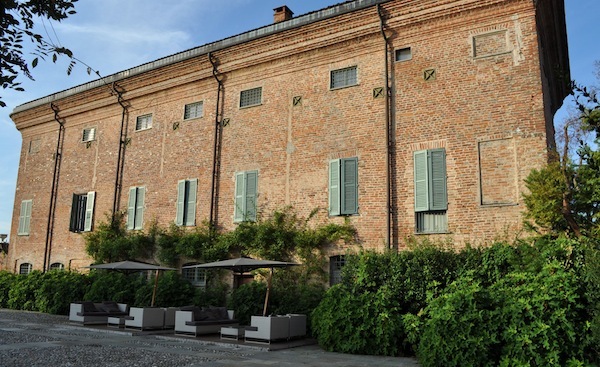 Readers visiting Piedmont who want to get a little rest and relaxation among the vineyards in a gorgeous, historic setting should check out the Relais del Sant’Uffizio.